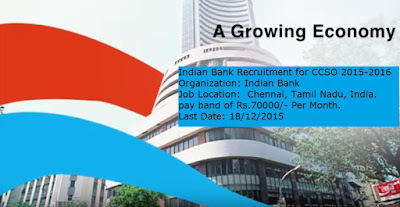 Indian Bank Invited Application through a advertisement notification to fulfill the vacant posts of Chief Customer Service Officer (CCSO) (Internal Ombudsman) on Contract Basis for the Job Locating at Chennai, Tamil Nadu, India. Interested and Eligible Candidates can apply Online on or before the closing date of the recruitment notification that is 18/12/2015. All Information about Position educational qualifications, age limit, selection and application process are given below. Job Location: Chennai, Tamil Nadu, India. Educational Qualifications: Applicants must be a Retired General Manager from any Scheduled Commercial Bank (other than Indian Bank). No of Post: Information regarding the total number of posts is not specified in the advertisement. Pay Scale: Selected candidates will be paid in the pay band of Rs.70000/- Per Month. Application Fee: Applicants have to pay Rs.1000/- through Credit/ Debit Cards of Master/ VISA/RuPay (or) by Net Banking of various Banks. Selection Procedure: Selection will be done on the basis of candidates’ performance in the written Test and Personal Interview conducted by the Indian Bank. Apply Mode: Applicants have to apply through online mode. Submission of Online Application Starting Date: 03/12/2015. Submission of Online Application Closing Date: 18/12/2015. How to Apply: Interested and Eligible Candidates can apply Online through the official website www.indianbank.in from 03/12/2015 to 18/12/2015.